S.T.Dupont Company goes back to its roots, art of traveling, and invites us for adventures and wandering with perfume pair presented in 2008, Passenger for Women and Passenger for Men. Passenger for Women is a fragrant date in a garden full of juicy citruses, green mandarin and bergamot which blend with juiciness of pear and black currant zest. A heart encompasses cyclamen, gardenia and rose, while base notes bring us warm breath of iris. Sandalwood and musk leave s silky soft trail on the skin. 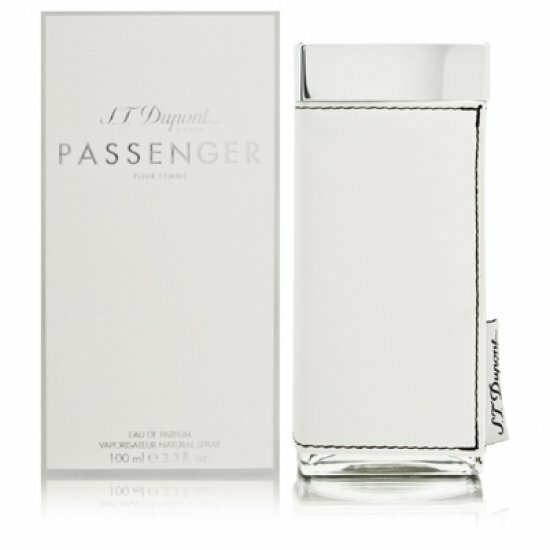 Passenger Cruise for Women is a fresh and refined floral - fruity - musky fragrance that opens with a burst of exotic pomegranate, Italian lemon, grap.. Passenger Escapade for Women by S.T. Dupont is a Floral Fruity fragrance for women. Passenger Escapade for Women was launched in 2014. Top notes are p..
S.T. Dupont pour Femme by S.T. Dupont is a Chypre Floral fragrance for women. S.T. Dupont pour Femme was launched in 1998. The nose behind this fragra..
S.T.Dupont Company goes back to its roots, art of traveling, and invites us for adventures and wandering with perfume pair presented in 2008, Passenge.. Essence Pure Pour Femme by S.T. Dupont is a Oriental Floral fragrance for women. Essence Pure Pour Femme was launched in 2002. Top notes are mandarin ..
Men's fragrance ST Dupont Pour Homme comes in an elegant bottle of 30, 50 and 100ml Eau de Toilette, conceptualized as a woody-aromatic fragrance with..
Dupont Oud Oriental by S.T. Dupont is a Oriental Floral fragrance for women and men. Dupont Oud Oriental was launched in 2012. The fragrance features ..
S.T. Dupont Noir by S.T. Dupont is a Woody Spicy fragrance for men. S.T. Dupont Noir was launched in 2006. The nose behind this fragrance is Michel Gi..